Usually, when I read about schizophrenics, people with Aspergers or OCD, or Hypomania, or depression, or toxic shock syndrome, or catscratch fever, I end up thinking: I'M LIKE THEM. 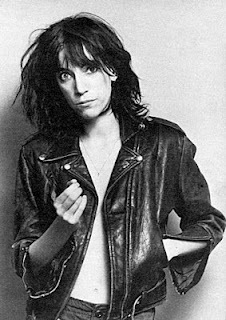 Today I had the good fortune of feeling that way about one of my ultimate mom style icons: Patti Smith. NY Times' fashion arbiter Ruth La Ferla dedicated an article in praise of Smith's unique style. Okay, so Smith is wearing an Ann Demeulemeester jacket and boots given to her by Johnny Depp during the interview. And I, currently, am not. 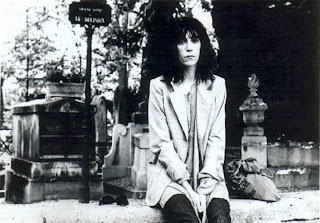 So today, I'm feeling not like I have meningitis, but Patti Smith's general sensibility when it comes to grooming. Praise the lord. 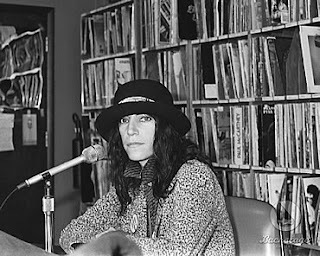 It seems that her daughter, Jesse, who sometimes accompanies her mom on piano, has taken some style cues from the icon, as well. Note the shruggy vest, with haphazardly placed accessories and scruffy black hair, on both Smith ladies. I have never been so available for adoption in my life. 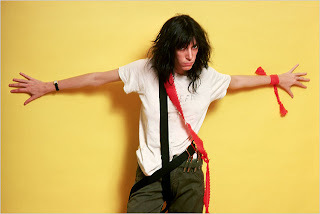 I love Patti Smith. 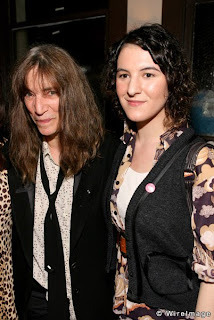 I went through a Patti Smith style stage in college but since I am short and curvy the cool androg look just made me look kind of dumpy. BTW-I have mild Asburgers...it's fun. It gives you an excuse not to talk to people who annoy you.